We’ve always known that prevention beforehand is better than having to get treatment after a health issue has arisen. In our own personal lives, we often try to make habits of healthy behaviors and we may even take extra safety precautions in order to avoid sickness or injury. The same principle holds true in reference to the workplace environment and the the lifestyle habits of employees. Just as it is more beneficial for an individual person to invest in preventative care prior to needing critical treatment, it is practical and wise for an organization to provide preventative programs and wellness screenings for their staff. When a company puts prevention into practice, it can benefit greatly from the results. #1) Employees will feel appreciated and cared for when their employer takes an interest in their personal health and wellbeing. #2) Employees will spend less time away from work if they can have their preventative health care needs taken care of right in the workplace! #3) Companies can save money in the long run because healthier employees means less to pay out in healthcare costs. #4) A general boost in workplace involvement and morale is often another key results of corporate wellness screenings. 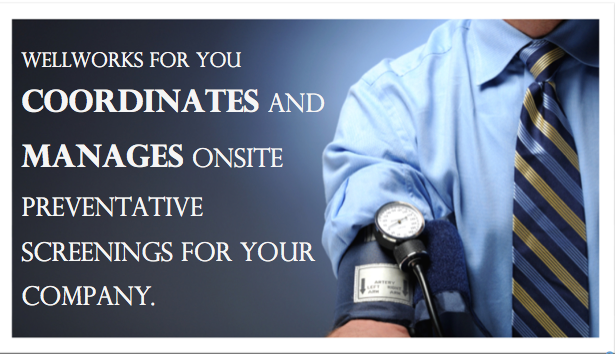 Now that we know all about the benefits, let’s take a look at what most wellness screenings will include. If you hire a professional wellness program provider to run the screenings, they will schedule licensed nurses to come to your location on a regular cycle (often this is monthly) to offer routine testing services. This will allow your staff to get immediate medical concerns addressed, ask any health-related questions they may have and get a general overview of the state of their health and what they can do to improve it…all without ever leaving work! Wellworks for You is a reputable and dependable corporate wellness program provider and we have been organizing and offering workplace wellness screenings for years. To learn more about our particular screening plans and to customize an option that will fit your employee’s needs, please refer to our overview linked below or call us at 1-800-425-4657.